Being boring could ‘kill’ your Social Media following. It will make people perceive your brand as a super duper boring brand. Therefore, you must think of some interesting content that can make people like it, comment on it as well as share it among their friends. Think out of the box or look for ideas in other brands’ circles so that you could come up with something more interesting of your own. There is a saying, “you’ll harvest what you sow.” By overdoing the freebies marketing, you will get a lot of non-loyal fans who are there for your free stuffs only, and not because they love your brand’s products and services. 3. Going Totally Out Of Point! Your Social Media theme must be closely related to your brand. It must reflect what your brand sells or market to the world. Always share content related to the things in your industry. If you sell shoes, your content should be about shoes and not about food or other things that are completely alienated from what your brand really is. There is only a one way speech and not a two way dialogue. Brands would just behave like news anchor persons disseminating information. And when people gave their feedback, only the positive ones stayed and the negative ones, banned. There is hardly any dialogue between the brand and the fans. Social media is a two-way street. It can’t be just one person talking all the time. It’s a conversation. You need to be active on all platforms. Don’t just talk about yourself or only share your work. Post content that will generate discussions. Pay attention to the people in your network. In other words, show people you care about them, and not just yourself. You’d be surprised how this type of interaction pays off. Don’t constantly ask people explicitly through online offers and sales discounts; shouting them out in each and every single post of yours, to make people buy your stuff. No one cares whether today is your boss’, your boss’ father’s, your boss’ brother’s or your boss’ cat’s birthday? Talk business and give your clients what they are looking for in your page. People just want to know how your product or services is going to be of benefit to them. If you have to share, don’t make it a ritual. 7. Not Monitoring your Social Media for Negative Comments…all Comments. Monitor your social media regularly. Check all the comments, all the tags..etc. Negative comments can bring down the credibility of your brand. Hence you to constantly manage the brand reputation. If the negative comments are proved to be genuine, it is ok not to delete or hide them as spam. You could simply publish your apology openly to the said user so that this will make others perceived your brand as honest and transparent. Who in the world has no flaws? Sometimes you will get companies advertising on your Page or competitors putting nasty and untrue comments about your brand on your timeline. Put them in their place. Be alert. Block, Ban and Report! By putting too much technical jargon or scientific terms is a bad strategy. It is not a PHD textbook, you know. And unless you want to make your fans and followers professors and doctors, refrain from using complicated jargon. 9. Tag or RT to Your Friends NOW! Never ever try to ask people to tag their friends to your pictures. Worse still, don’t give them a specific number of friends to tag in order to exchange some kind of gifts from you. Tagging and RTing is good as it can increase the brand’s exposure virally but let them do it out of their own wish. It is very irritating when that funny “spammy” picture just appears in your profile page without your permission. I block the company’s facebook page immediately. The first item for visitors to spot on A social media page is the bio(About on Facebook). You must complete this section with vital information, like location and website [URL]. It should look interesting, too. Have a little fun with it. If you’re creative and interesting, it will give more of an incentive to follow or like you. 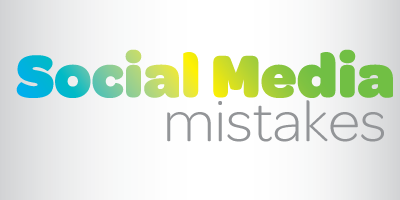 What other mistakes do you think Companies do with their Social Media? Add in the comments section below.